What Happens if Your Adoption Fees Aren't Protected? Sometimes we need to talk about the hard things. There are difficult realities in adoption. These aspects of the process sometimes seem easier to just ignore — it doesn’t feel good to consider them. That may work, until it happens. Then, when you’re in the middle of a challenging situation, you’ll wish you had confronted it earlier. In this instance, we’re talking about a tricky pairing: adoption costs and potential disruptions. If you are considering adoption, it’s important to go in with eyes wide open. The costs associated with adoption can be a challenge for families, and, depending on which adoption professional you work with, an adoption disruption can be both emotionally and financially devastating. It doesn’t have to be this way, though. With the right adoption professional, you can prepare for all the potential outcomes of the adoption process — the likely good outcomes and the unlikely, but possible, undesirable outcomes. It’s important to understand the context for why we need to talk about protecting adoption fees. Families work hard to save up for adoption. Whether they work through fundraising, loans or grants, a lot of effort goes into preparing for adoption. There are several ways this preparation can go to waste if adoption fees aren’t protected. First, there’s the chance that services rendered are not the same as services promised. Some adoption professionals have a bigger bark than bite, and families find what they were advertised is not what is not true. If this happens, an adoptive family may understandably want to try a different adoption professional. And if the adoption fees aren’t protected, the only way to do this is for a family to cut their losses and move on. The adoption professional that doesn’t have any promised protection for fees will keep the money that has already been invested in the process. Second, there’s always the possibility of an adoption disruption. An adoption disruption is when an adoption opportunity is dissolved. This can happen before placement when the prospective birth mother is still pregnant. It can also happen, especially in foster care adoption, after placement when a child is already with an adoptive family. While adoption disruptions are not that common, they do occur. If adoption fees aren’t protected, there is a chance all the fees that have been put into the process can be lost. This adds financial troubles to emotional hardship. These scenarios are two of the most common challenges faced in the adoption process. There are others, because every process is unique. 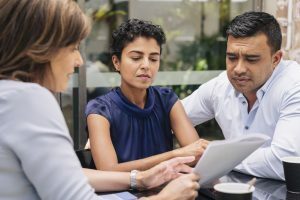 The important takeaway is that financial protection is something every family should ask their adoption professional about at the beginning of the process. Adoption can be expensive. The adoption process is governed by complex laws and regulations, and in order for it to be completed successfully, it takes an expert team of social workers, administrators, attorneys and more. There are costs associated with all this work. For a more complete rundown of adoption costs, you can check out American Adoptions’ guide. Here, we’re looking at one specific question: What happens to your money is something goes wrong? The answer to that question depends on which adoption professionals you work with. Basically, there are three drastically different possibilities. Possibility One: Sorry, you’re out the money. As illustrated above, it is possible for a family to lose the fees they have invested in the process if something goes wrong. This happens when an adoption professional offers no protection or insurance for fees. An adoption professional who doesn’t offer any sort of protection for fees will likely beat around the bush when asked about it, and this should be a red flag for adoptive families. Possibility Two: We’ll hold on to your money, but we’ll put it toward a new adoption if one comes up. This is the most common answer families will find among adoption professionals. This approach to adoption fee protection is known as a “rollover” policy. As in, the adoption professional will roll over the fees from a disrupted adoption toward a new adoption opportunity if and when it arises. This approach to protecting fees is better than nothing, but it still has drawbacks. Since the money is never relinquished by the adoption professional, families have less freedom to take a break from adoption or try a new adoption professional. While rollover policies promise to protect a family’s investment, there is still the chance that the money is lost. Possibility Three: This is your money, and you deserve to have it back if something goes wrong. An adoption disruption isn’t your fault. Disruptions can happen for a variety of reasons. At American Adoptions, we believe in protecting the financial investment families make in the process, which is why we have a Risk-Sharing Program that refunds the fees directly to adoptive parents in the case of a disrupted adoption. Unlike rollover programs, this risk-sharing approach gives families the most freedom and flexibility. You have worked so hard for this, and you deserve nothing less. Any family considering adoption should find an adoption professional that offers the most secure protection possible. While we all hope disruptions never happen, it’s best to be prepared for the possibility by working with an adoption professional that has your best interests at heart. To learn more about adoption fee protection and American Adoptions’ Risk-Sharing Program, you can call 1-800-ADOPTION to speak with a professional at any time.